Make a little extra effort to escape the crowds! Explore the genuine forgotten city! Visit Koh Ker’s long abandoned monuments! And on the way see the best example of a lost temple, overgrown by the jungle, Beng Mealea! - My webpages try to be most informative on their historical background. If you are looking for an adventurous “lost temple” feeling or a genuine “explorer” experience, undisturbed by noisy busloads - don’t miss Koh Ker in Preah Vihear Province! It’s the most amazing temple town in a distant jungle location off the beaten track, right in the heart of the remote and undeveloped countryside of northern Cambodia. Left to the vegetation for a millennium, the lonely temples of Koh Ker were not easy to reach for French exlorers in the 19th and 20th century and remained unrestored. Only two decades ago, this region was the last stronghold of Khmer Rouge guerilla fighters. Almost 200 ruins - most of them still inaccessible - cover an area of more than 20 km in diameter. 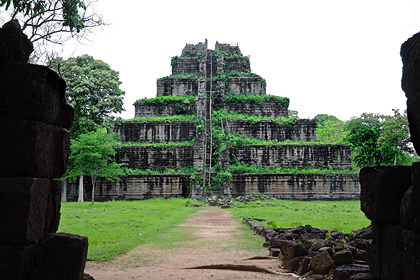 Known as Chok Gargyar in inscriptions, Koh Ker served as the capital of Jayavarman IV, who reigned from 928 to 942. He used this short period for a prolific construction programme on an unprecedented scale, collecting taxes and hiring labour forces from all parts of his Khmer empire. 1. The artificial temple mountain Prasat Prang, attached to Koh Ker’s vast main temple complex, Prasat Thom, is a perfectly well proportioned stepped pyramid with seven tiers, resembling mesoamerican Maya pyramids more than any other Khmer monument. The modern wooden staircase to the top has been closed, after a Japanese visitor broke his leg here. 2. Five so-called Linga-shrines near Prasat Thom shelter the biggest specimens of Shiva-phallus-symbols ever created in Khmer sculptural art. 3. Prasat Banteay Peechean, the only ancient Khmer temple compound dedicated to Brahma, is the most picturesque among many untouched ruins in the tranquil surrounding of tropical dry forest. Other complexes of similar size are Prasat Chrap, Prasat Krachap, and Prasat Damrei, the latter being famous for elephant and lion sculptures. 4. Last not least, Prasat Pram is the overgrown jungle temple par excellence, phantastically draped by roots of a tree growing on the roof. The era of King Jayavarman IV was a prolific period for gigantic works of sculptural art, too. But those specimen which were not stolen are in museums now, particularly in the National Museum in Phnom Penh. Koh Ker remains to be far away from the tourist flows, because it offers only few local restaurants and very simple accommodation until now, with electric current produced by a generator only during evening hours. This is why a trip from Siem Reap is the best way to explore Koh Ker, Cambodia’s most excellent destination for all those travellers who like to see those extraordinary sites most people never reach. Visiting Koh Ker and Beng Mealea on the same day is possible, if you are ready to start in Siem Reap in the early morning (7.30) and accept a return not before nightfall. Beng Mealea is situated halfway between Siem Reap and Koh Ker. Parts of the road between Beng Mealea and Koh Ker are not in a good condition. Driving distance between Siem Reap and Koh Ker is 110 km (one way). 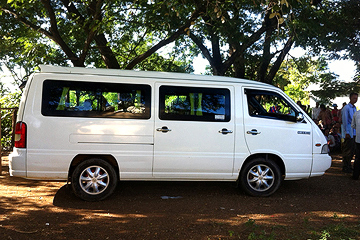 My prices for driving service will depend on your tour itinerary and respective kilometres and on the vehicle category. Please let me know if you want to travel by van or car. I can offer cheap Tuktuk-tours, too, but only to Beng Mealea and destinations on the way, such as Roluos, Kampong Phluk or Phnom Kulen quarries (not to Phnom Kulen mountain plateau and not to Koh Ker, that's simply not possible by tuktuk). Of course, we can stop at interesting places on the way, for photos or eating or visiting local markets. Only small restaurants with local Khmer food are available in Koh Ker. But if you like, I can provide a lunch box at the site. Please be aware: Angkor tickets are not valid outside Angkor + Roluos + Banteay Srei. So besides costs for driving service, there are additional entry fees: Visiting Koh Ker costs $10 per person, while Beng Mealea charges $5 per person. Maybe you are interested in visiting other ancient Khmer temples and cities lost in the jungle, too, the famous mountain temple Preah Vihear, the Buddhist face-tower temple Banteay Chhmar, the vastest temple compound Preah Khan at Kampong Svay or Cambodia's most ancient temple town Sambor Prei Kuk. In this case I can offer several-day combinations with overnight stays in Sra Em or Banteay Chhmar or Kampong Thom. You can find carefully worked out itineries on my main website offering comprehensive information on Koh Ker. Visit the atmospheric jungle temple Beng Mealea, on the way to Koh Ker or in combination with other destinations closer to Angkor. Beng Mealea still looks like in the 19th century, when early French explorers found the huge complex swallowed by the jungle. Most parts of the long abandoned vast compound of Beng Mealea are not yet restored. Built in the 12th century, most probably during the reign of King Suryavarman II, Beng Mealea is in the same style as Angkor Wat, in layout, construction techniques and decoration quite similar to it. But in contrast to Angkor Wat, Beng Mealea is mostly in ruins, with lichen-covered walls strangled by roots, trees growing on the temple towers and huge sandstone blocks lying in piles. Even the very centre of the temple compound is such a heap of stones, since the central tower has collapsed. Vine-entangled ruins hidden in a forest and romantically draped in vegetation, that’s the imagination of a lost temple in the jungle coming true in Beng Mealea! The modern main entry for visitors is from the south. But there is also a less frequented footpath from the west, where you could be dropped off. Since 2004, a system of wooden footbridges makes it easy to walk around in the labyrinthic complex. The bridges and walkways were constructed as setting of Jean-Jacques Annaud’s movie “Two Brothers”, after the shooting they have been left for visitors. This wooden walkway is not only convenient, it also contributes to maintaining the remaining structure. Beng Mealea has been cleared of mines at the end of 2003 by the HALO trust, the world's oldest and largest humanitarian landmine clearance organisation. Thanks to the dangerous work of deminers, supported by foreign donours, Beng Mealea as well as all major monuments along the ring road of Koh Ker are free of landmines now and safe for visitors. 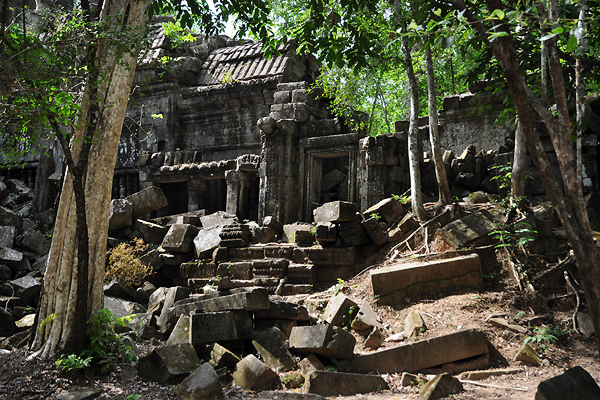 Beng Mealea is situated in about 60 km driving distance from Siem Reap. The second half of the road to the jungle temple leads through typical Khmer countryside, which is pretty picturesque. If you take your time for Beng Mealea and its surrounding (without visiting Koh Ker on the very same day), you can also visit the quarries at the southern foot of Kulen mountain, where the sandstone for the construction of the Angkor temples was quarried. Yes, Beng Mealea is a romantic ruin. But to be honest: No, Beng Mealea is not a tranquil site any more, not an insider tip, not off the beaten track! It is frequented even by busgroups. And a restaurant and souvenir shop area is just south of the temple's moat, between ticket boot and main entry. But in contrast to Beng Mealea, Koh Ker still remains to be a lonely place, too far away from the mainroad to Phnom Penh. A German version of this website is online, too. as well as some more photos. 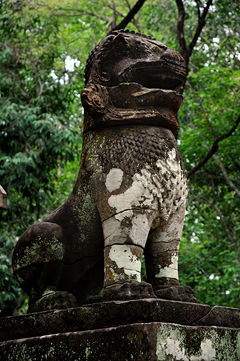 offering lots of detailed information about temples in and around Angkor. in north-eastern Thailand, the region known as Isan.